I like Thanksgiving. We may not all always feel grateful for our circumstances, but an attitude of gratefulness is healthy, I’m convinced. So, happy Thanksgiving! 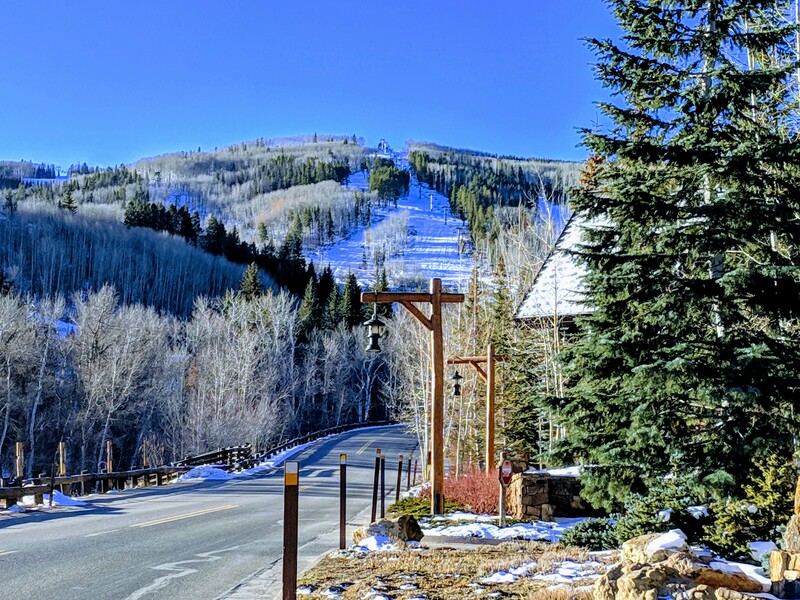 Karen and I will be feeling festively appreciative this year high in the Rockies, in Beaver Creek. As November fades, markets seem ungrateful. One Wall Street Journal article Friday noted that the majority of companies beating estimates this quarter underperformed. The author concluded that where investors before rewarded companies for exceeding expectations, now they have to offer rosier future views. What data supports that contention? There were no investors interviewed for the piece who said they dumped stocks like AMD, which was down 27% on results. Why would an investor lop 27% off returns in a day – gains earned by risking holding shares for months or longer? It defies logic, and things defying logic should be scrutinized. Only arbitragers profit when stocks fall – those betting on different prices for the same thing. High-speed traders, hedge funds that bet short, and market-makers for Exchange Traded Funds (ETFs). Only one of these is ordered by regulators to engage in arbitrage. ETF market-makers. Isn’t it extreme to say “ordered?” No. ETFs don’t work without an arbitrage mechanism because they don’t have intrinsic value. ETFs are exempted by the SEC from the requirement in the Investment Act of 1940 to offer investors a single price for fund shares, and to make those shares redeemable in a proportionate chunk of the underlying pool of assets. The SEC granted relief to creators of ETFs because there are two markets, two different prices for ETFs – fostering economic incentive to support them by buying low and selling high, so to speak. Because ETFs are not redeemable – can’t be traded for money in a pool – market-makers have an unusually strong economic motivation to chase and foster big divergences. They can trade ETF shares for stocks, and vice versa. If money flows into the market and investors want to buy ETFs, market-makers gather up a collection of stocks to trade to firms like Blackrock for the right to create ETF shares. They want stocks that are easy to buy or borrow or swap for, and ones that have outperformed or underperformed. Why? Because stocks that have outperformed will be shed soon by Blackrock and other ETF creators, which can wash out associated capital gains by offering them as collateral to trade for ETF shares. So brokers might borrow them and then buy puts, knowing the likelihood that these stocks will be on the ETF chopping block soon is high. Conversely, when stocks plunge in value, ETF market-makers will buy them to use as collateral for ETF shares that can be quickly marked up and sold at a profit. Passive money dominated AMD around results. Same with ALGN, which also plummeted on results that beat expectations. Both stocks were 50% or more short ahead of results. Think of it this way: Your stock is gold, and ETF shares are gold-backed dollar bills. Suppose gold could be acquired for half-price. If the currency stays the same, you make 50%. So you really, really want to find cheap gold. Whoever trades stocks sets the price. It’s not determined by who OWNS the stocks. Suppose investors stopped buying AMD and ALGN to study results. Smart market-makers for ETFs would detect the lack of normal buying and would sell and short them aggressively so the prices would fall. Then they would scoop both up at depressed prices to supply to Blackrock in exchange for the right to create ETF shares – even ETF shares for safe-harbor value ETFs. Stocks are collateral. Motivation for market-makers shuffling collateral around is not investing. It’s profiting on price-differences for the same thing. This behavior is as we’ve said repeatedly far bigger than any form of fund-flows. 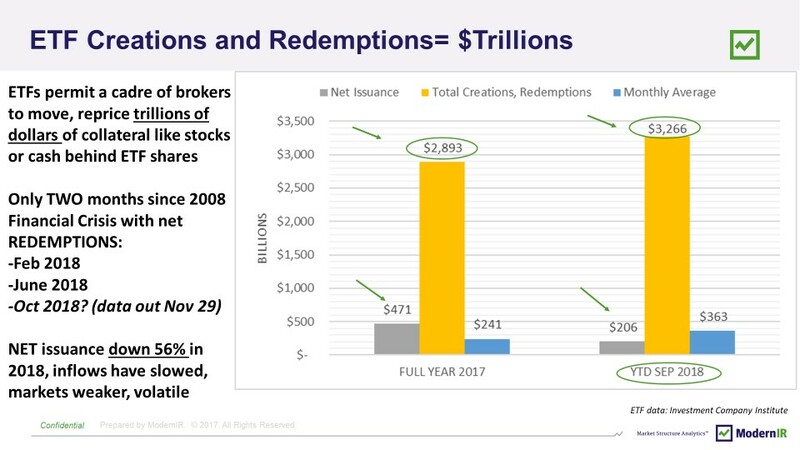 ETF creations and redemptions totaled $3.3 trillion through September this year, or more than $360 billion monthly. I believe the data will show – it won’t be out until the last trading day this month – that there were ETF outflows in October for the third time this year (also in February and June, and in both months stock-market gains vanished, and in Feb stocks corrected), and the third time since the Financial Crisis. The risk in a prolonged down market is that ETF shares and the value of collateral – stocks – are both declining simultaneously. Market-makers can pick one and short it, or pick both and short both, in the hopes that if and when the market recovers, they get it right. But if they’re wrong, the sheer size of ETF creations and redemptions says there’s not enough collateral to cover obligations. Today, VIX volatility bets are lapsing ahead of Thanksgiving to conclude a horrific Nov expirations cycle. I think it’ll sort out. If not, the bull market could end. And a major contributor when that happens will be the all-out pursuit of collateral over investment by ETFs. I can’t find a team (men’s or women’s) headed to March Madness, the annual collegiate sports fete in the USA, wearing green and purple. But the market’s awash in them. Don’t you mean red and green, Tim? Buy and selling? No, green and purple. See this image? Green and purple are Passive Investment and Risk Management, a combination revealing how arbitrage in Exchange Traded Funds (ETFs) is taking over the stock market. In the first circle, green and purple coincide with short covering (lower bar graph) and a surge in price. In the second, green and purple again, shorting up, price falls. It’s an anonymous stock exemplar but we see these patterns everywhere. Some pundits, coughing in advance, said it was reduced fears of tariffs on Canada and Mexico. It may be the green and purple gang and not rational thought at all. I’ve written before about the “arbitrage mechanism” for ETFs. Google “ETF arbitrage mechanism.” It’s presented as a good thing – the way ETFs can closely track an index. Yet apart from ETFs, regulators, congresspersons, pundits, investors, all rail at “the arbitragers” for distorting prices and manipulating markets. Isn’t it cognitively dissonant to say it’s good for ETFs but bad elsewhere? If we don’t know what’s pricing the market because a pervasive “arbitrage mechanism” – green and purple going long and short – trumps Trump tariffs or any other fundamental consideration, the market cannot serve as a reliable barometer for corporate effort or economic activity. I’m surprised it’s not troubling to more. For every trade executed in the stock market in December, 19 were cancelled before matching according to Midas data from the SEC. Of those that completed, 30% were odd lots – less than 100 shares (no wonder average trade size is about 180 shares). Trade-cancellations in ETFs run about four times higher than in stocks, near 80-to-1, Midas shows. If trading motivation is changing the price, cancellations will run high. Investors don’t do it. Profiting on price-differences is arbitrage. Only 5% of US stock orders execute, suggesting a lot of arbitrage. It’s rampant in ETFs. Green and purple. Here’s what I think. Brokers trade collateral like stocks and cash at a fixed, net-asset-value to ETF sponsors tax-free for ETF shares. They cover borrowed stock-shares, bet long in futures and options on the indexes and components and sell ETF shares to investors. When the group or index or sector or market-measure has appreciated to the point the ETF sponsor will incur taxes on low-basis stocks in the collateral the brokers provided, the brokers short those stocks and the options and futures and buy the ETF shares and return them to receive the collateral back in exchange. Headlines may create entries and exits. This process repeats relentlessly, prompting investors and pundits and companies to draw widespread false correlations between market behavior and fundamental or economic factors. It’s a genius way for brokers, traders and fund sponsors to make money. One could say we all benefit by extension. To a point, yes. So long as more money comes into the market than leaves it, stocks rise. Volatility mounts on over-correction, where the arbitragers cover at the wrong time, short at the wrong time or exchange collateral for ETF shares in ill-timed ways, leaving puzzled people watching the tape. Upon reflection, I guess it’s a good thing no team is wearing green and purple. The rest of us would do well to get as good at pattern-recognition as we are at PE ratios, because the patterns are setting prices. Watch the green and purple.